Last Saturday's visit to our son and family in Bobcageon. Bruce and Ann were having Henry and Heidi over for a few days while their parents had a romantic getaway. Heidi is going to be 1 year old on March 26.
she knows her Nanna very well, but this is the first time Babba and Nanna have the granchildren over without the parents. Heidi, from what I hear is a very poor sleeper and she was so tired but wouldn't lie down. Nanna looks tired too. Heidi wouldn't come to me. when put on my lap (she's very heavy), she wiggles and wiggles around until Nanna picks her up again. our next visit is Easter when we all get together (23 family member incl. kids) to celebrate Easter and Heidi's first birthday at the same time. looking forward to it. A lovely family shot of three beautiful ladies of the family. Awww- even with a frown on her face she's adorable! 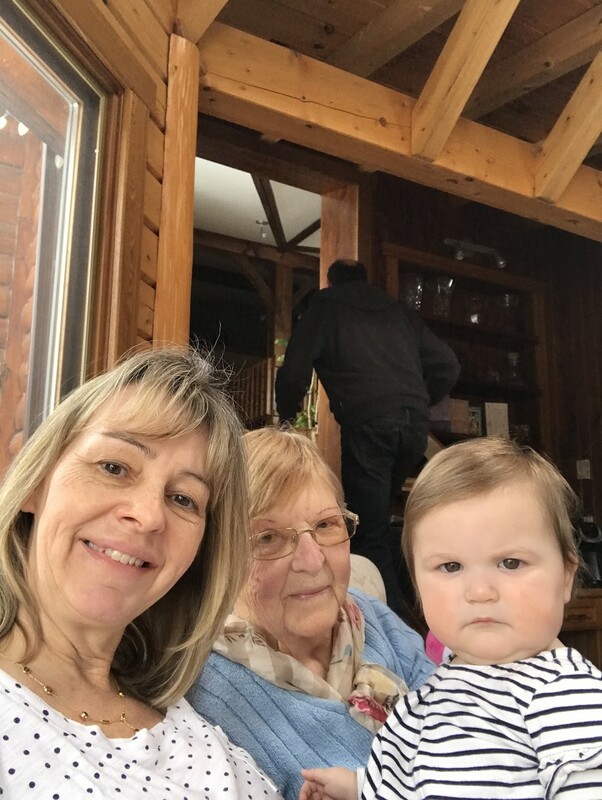 What a sweet photo of four generations (missing the third of course). She looks a unsure of the camera!